Hudson Valley for No GMOs: Hudson Valley for No GMOs in the News! Hudson Valley for No GMOs in the News! Journal May 9; and an opinion piece by me that was in the Poughkeepsie Journal, May 10. It began almost two years ago. Hundreds of parents, students, teachers, farmers and others in the Hudson Valley joined millions of protesters worldwide to March Against Monsanto. They protested the genetically modified seeds the company produces that now account for a large amount of the food Americans eat. 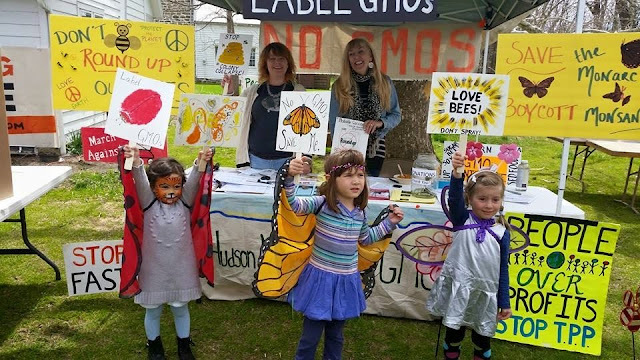 "We had an amazing march," said Barbara Upton, co-founder of Hudson Valley for No GMOs. "On a cold, windy day we had 400 people take over Main Street in New Paltz, demanding we know what we're eating and feeding our families." Currently, the majority of corn, soy and alfalfa grown in the U.S. is GMO (Genetically Modified Organisms). And in February, the USDA approved two varieties of non-browning GMO apples, some of the first GMO whole foods to reach the U.S. While the amount of unlabeled GMOs in our food supply is increasing, the Non-GMO movement is also growing globally and in the Hudson Valley, as more evidence comes to light that the safety of GMO products is unproven. More marches against Monsanto are planned this month in Albany and New York City, among other places. The Hudson Valley contingent is ready and eager to go. Joel Tyner, Dutchess County Legislator and founder of GMO-Free Dutchess on Facebook, is one local critic who plans to attend the march. Saying that the non-GMO movement is growing locally "is the biggest understatement of the millennium," said the long-time environmental advocate. GMOs were introduced by Monsanto into the American food supply in the mid-1990s. Touted as a biotechnology achievement, GMO seeds were engineered to resist insects and include one or more genes from another organism, such as a bacterium or other microbe, or plant species. GMO seeds and the resulting crops are designed to withstand doses of Monsanto's Roundup, which contains glyphosate, a weed killer that was supposed to be harmless to humans and animals. After close to two decades of use, many experts contend that Roundup is harmful to the environment, animals and people. When contacted for comment, Monsanto's Charla Lord, senior media communications manager, Corporate Engagement, declined, directing inquiries to Karen Batra, director, Food and Agriculture Communications, Biotechnology Industry Organization, a trade association representing the bio-tech industry. "The fact is we have been studying this technology for decades," Batra said. "Thousands of studies to assess the health and safety of (GMO) food products concluded as a food product there's no compositional difference. And the scientific community in many reports say GMO crops are sustainably better for the environment." Jeffrey Smith, author and GMO expert who founded the Institute for Responsible Technology (IRT), said, "Before the FDA decided to allow GMOs into food without labeling, FDA scientists had repeatedly warned that GM foods can create unpredictable, hard-to-detect side effects, including allergies, toxins, new diseases and nutritional problems. They urged long-term safety studies, but were ignored." Monsanto's Bt corn, which contains a gene from a bacterium that naturally produces a toxin that acts as a pesticide, is also worrisome, according to opponents. While it was supposed to reduce the amount of insecticides used to kill pests, instead they have developed resistance to the GM toxin. A 2011 Canadian study found that Bt toxin, which was supposed to be destroyed in the human digestive system, reached the bloodstream of pregnant women and crossed the placenta. It was in 80 percent of umbilical blood in newborn babies. Other studies and widespread anecdotal evidence suggest that GMO foods can cause inflammation, digestive, kidney, liver and other problems in animals and humans, and GMOs do not increase farmers' yields or productivity, as Monsanto advertised. However, according to the Monsanto website, farmers have grown GM crops worldwide for more than 15 years with no substantiated reports of any food safety issues. "There's a lot of evidence that the use of GMO feed decreases the health of livestock and farmers' profitability," Smith said. "When farmers switched (back) to non-GMO feed, there was an increase in conception rates, a higher litter size and fewer birth defects. There was also a decrease in the need for antibiotics." However, farmers locally and across the country who want to avoid GMOs are having trouble purchasing non-GMO seeds because "the industry is so powerful," Upton said, noting that bio-tech companies are buying out non-GMO seed companies. While many scientists would like to further research the effects of GMOs on health and the environment, it's difficult for them to do so. In fact, it's illegal to study Monsanto's seeds because of intellectual property laws, said Elizabeth Dulay, co-founder of Hudson Valley for No GMOs. "Bio-tech companies are coming after scientists who report on this," she said, noting that her stomach problems stopped once she eliminated GMOs from her diet. "They want to protect their investment in this technology." While other countries require food with GMOS be labeled so consumers can choose to either eat or avoid GMOs, the U.S. doesn't. According to the Monsanto website, "Within the United States, the FDA requires labeling of ingredients. If there is a meaningful difference in the safety, composition or nutrition of the crop from which the ingredients were derived, the FDA could require additional information be added to the label. This is not the case for GM ingredients." "Over 3 billion people in the world know they're eating GMOs because they're labeled. And we don't," Upton said. "That's wrong." Tyner, who plans to reintroduce an updated labeling resolution this spring to the Dutchess County Legislature, said the lack of labeling in the U.S. is due in part to fear of retribution. "It's simple common sense to label," he said, noting that this is a bi-partisan issue. "Politicians are afraid of the deep pockets of big Ag and Monsanto. It's a sad testament to the power of money." Even if you opt for food produced on farms that do not use GMO seeds or feed their animals GMO crops, experts warn that you can't be sure it is GMO-free, due to cross-contamination. Many are concerned that this trend may not be reversible. According to the IRT, it's impossible to fully clean up the contaminated gene pool. "The potential impact is huge, threatening the health of future generations," said Smith, noting that cross-contamination has caused economic losses for organic and non-GMO farmers who often struggle to keep their crops GMO-free. Many non-GMO farmers have to bear the cost of building buffer zones to try and keep GMOs off their land. They also have to worry about being sued by Monsanto for alleged violations of its seed patents when GMO crops caused by cross-contamination are found on their property. "Pollen is carried by birds, insects and wind," said Michael Boms, an adjunct professor of biology at the State University of New York at New Paltz, noting that pollen then cross-pollinates non-GMO crops and turns them into GMO crops. "Bees, birds and wind don't have any boundaries. They don't know they can't go across the field to a non-GMO farm." In fact, GMOs are so ubiquitous in our food supply they're hard to avoid. "About 80 percent of food in the U.S. contains GMOs," said Boms, who helped organize a non-GMO event at SUNY New Paltz last year where more than 400 people turned out to hear Smith talk about the topic. "In Europe, only 5 percent of food people buy contain GMOs." Boms said he believes the reason Europeans don't buy as much GMO food is that the products are clearly labeled and they can more easily make a choice to avoid them. "In this country, we have to prove something harmful. In Europe, the manufacturers must prove that their product is safe," he said, noting that poor rates of consumption by Europeans have caused some food manufacturers who sell there to revert back to offering non-GMO goods. Mandatory GMO labeling in the U.S. is not appropriate, according to Batra. "Mandatory labeling is reserved for information about nutrition, ingredient contents or safety concerns like an allergen," she said, noting that the voluntary labeling program "is working. "Since GMO foods are not compositionally different than regular food, mandatory labels are not needed and can confuse and alarm the public." While labeling is a huge concern for many, and a political and social issue for some, it's more personal. Nicole Jurain is one of them. When her son was 2 1/2, he developed reflux as well as suffering from bloating, gas and rashes. "Our son was on and off the autism spectrum," she said, noting that she discovered he had a corn allergy. "Corn has so many derivatives and they're all genetically modified," said Jurain, founder of Corn Freedom, an initiative to raise awareness about corn allergies. The New Paltz mom and her family decided to go completely organic. "Once we got him off all corn and GMO food he was fine," she said. The IRT has heard similar stories from many other families. "Thousands of people report that when they get rid of GMOs their health improves," said Smith, noting that many vets also contend animal health improves when their feed is changed to a non-GMO variety. Many doctors also agree. In fact, the American Academy of Environmental Medicine, an international association of physicians and other professionals, urges doctors to prescribe non-GMO diets for all patients. While it may seem like an uphill battle to reverse the proliferation of GMOs and get the U.S. government to require GMO food labeling. local activists, proponents of organic food and others are determined to keep trying. "Monsanto has deep pockets and huge influence. But I think it would be a mistake to underestimate the power and passion of people fighting to ensure a safe and healthy food supply, and to protect our environment from the pesticidal onslaught that accompanies GMOs because of their inevitable super weeds and super bugs," Upton said. "The more people learn, the larger this movement will grow." •The Non-GMO Project: Since the U.S. government does not mandate that food containing GMO ingredients be labeled, some companies have their products independently tested and verified as GMO-free by the non-profit group Non-GMO Project. Before a product can receive the non-GMO verification seal, all of its at-risk ingredients must be tested and contain no more than 0.9 percent GMOs. While companies may strive to be 100 percent GMO-free, due to cross-contamination, it's difficult to reach this goal. Visit www.nongmoproject.org for more information. •Non-GMO Shopping Guide: The Institute for Responsible Technology has put together a list of products that has been non-GMO verified. It contains information on items such as baby food, pet food, fruits, vegetables, dairy products, meats and more. The pamphlet can be downloaded from the website or you can purchase a pocket guide, www.nongmoshoppingguide.com. Because this is getting long, I'll post my opinion piece in a new post.